The biggest and longest festival of hindus are around the corner. While rest of the India is fevering for Navaratri, the city of Bengalis are fevering with Durga Puja. Being a Bengali, I am also suffering from the above fever I mentioned and totally excited for upcoming festive days. Delicious delicacies are always the part of this festive occasion. For the filling ~ Wash and pat dry the prawn, make a paste. 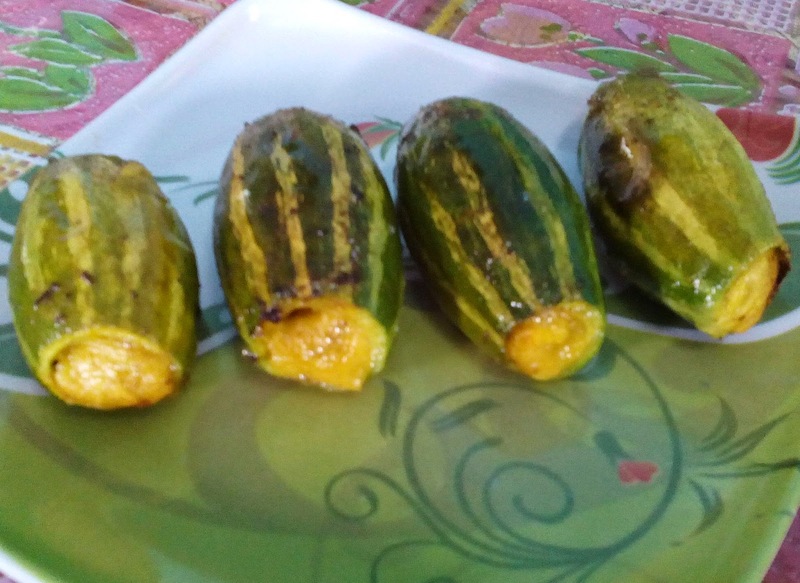 Make a paste of pointed gourd seeds. Now fry them with little salt and turmeric powder. Let it cool for sometime. Heat 1 tsp oil in a pan, add 2tsp onion paste until pinkish in color. Then add half of ginger and garlic paste, turmeric, red chilli, roasted cumin powder, saute till the raw smell goes off. 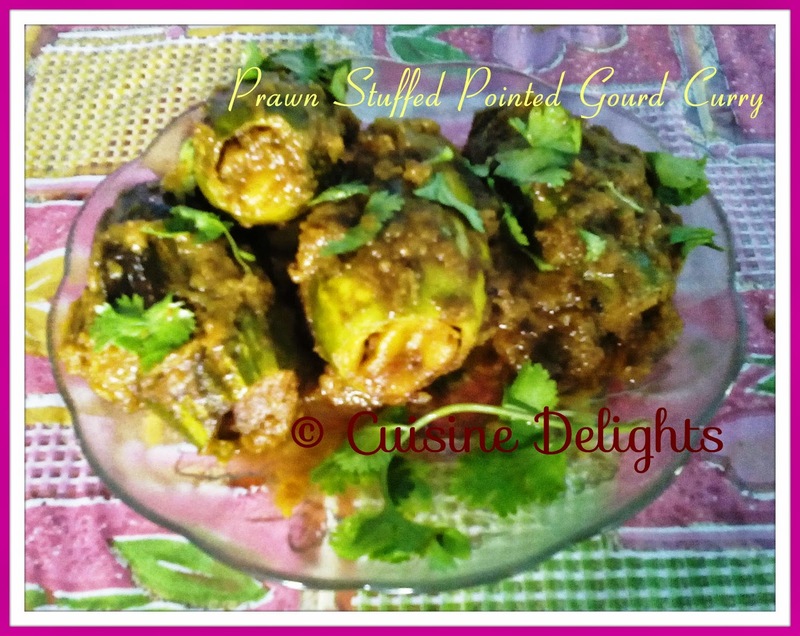 Now add fried prawn and pointed gourd seeds paste, stir well and cook until oil starts releasing from sides of the pan. Sprinkle a very little water at this time and give a nice stir. Prawn stuffing is ready now. Take them out of the pan and keep separately until it becomes cool. Wash and clean the pointed gourds at first. Then scrape the whole skin of each of them with a knife. then cut one end little, near the edge and the other end little big. the big cut helps to enter a spoon inside to scope out the seeds. Now stuff the fish filling in the pointed gourd. Make a thick batter of besan or maida and water. Use this batter to seal the end of the pointed gourds. Heat white oil in a pan, add stuffed pointed gourds at a time two or three, fry in lower flame with lid. Stirring it vigorously fry them very carefully. Take a separate pan, heat the mustard oil add rest of onion paste and sugar, saute until brown. Now add rest of ginger-garlic paste, tomato puree, turmeric powder, kashmiri red chilli powder, roasted cumin powder and salt, mix thoroughly. Cook on medium flame till the oil starts to release from the sides and add pour the water and cover. Let it boil for sometime. Now uncovered and add the garam masala powder and cover again for a while so that the aroma of it could be absorbed the curry. Then add the stuffed pointed gourd, cook on low flame. 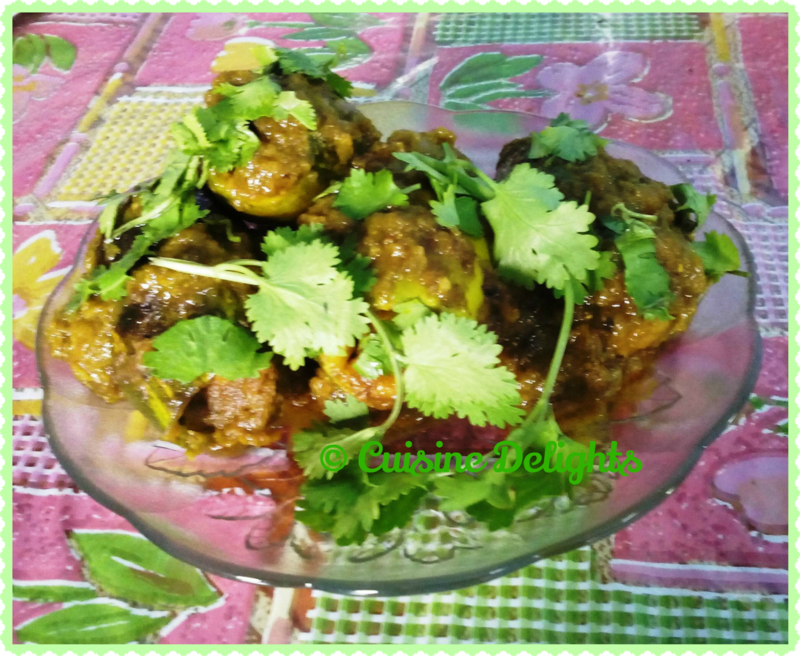 Once one side the pointed gourds is covered by the gravy turn them and cook the another side for few more times. Turn off the flame and add chopped coriander leaves. 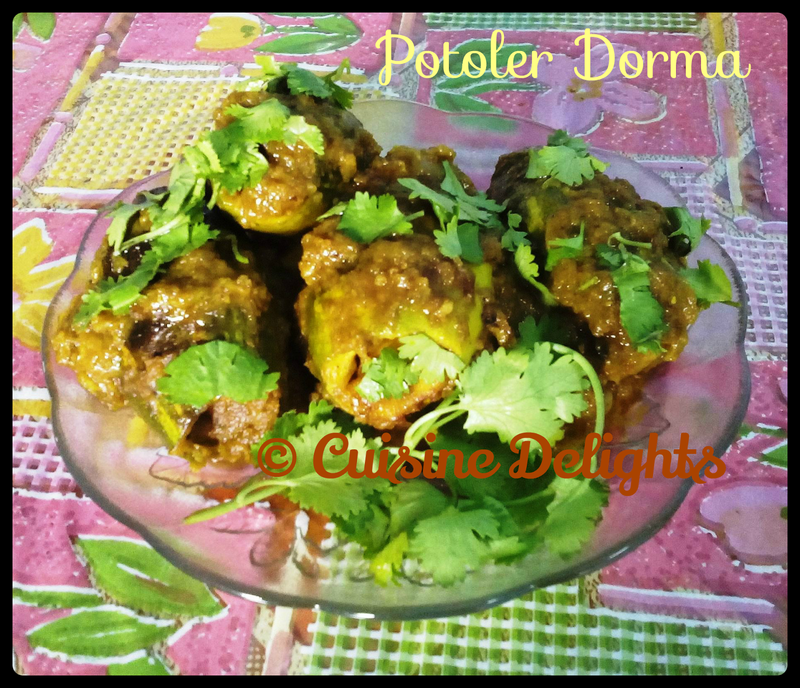 Potoler dorma / dolma is ready to serve.